The following is a guest article written by forum member Dan “Nomad” Muzenjak. Thank you, Dan, for sharing your hard work with us. This article is a culmination of the work of many on this and other web sites. The sole purpose is to clearly define and outline the steps necessary to modify your HP EX485/487 MediaSmart Server (or MSS) from a single core Intel Celeron 440 to the more powerful Intel Dual Core. It will present various options for the MSS user and provide a one stop resource for the complete upgrade process. Choosing a CPU, performance gains/benchmarks, power consumption temperature and memory upgrades are discussed as well. I will try to sort thru some of the technical jargon and issues that can make this process complicated. While the scope of this article will surround the E5200 CPU that has been extensively tested it will also list the other CPU designations reported to work for your consideration. Depending on your level of expertise you might find some topics interesting or boring but there listed here regardless of your abilities. Some useful tips have been included and some very useful links have been placed in the reference sections at the end of the article. The author of the article assumes no responsibility for “bricking” “smoking” or voiding the warranty of your MSS as a result of your action. Safe to say if you take the cover off you have probably voided the warranty. Read this document completely before diving in! If you do not feel comfortable with disassembly, modifications, handling electronics parts, software configuration or are not familiar with electrostatic procedures you should stop here and get help. OK, now that we have satisfied the lawyers out there lets move on. The HP MediaSmart Server EX48X series (EX485/7) are second generation servers that were released as a replacement for the EX47X. The EX485/7 come provisioned with an Intel Celeron 440 single core 2Ghz processor. This was an upgrade over the less powerful AMD cores used in the 470 series. The Celeron 440 provides reasonable performance for basic operations, WHS administrations, backups, photo management and file functions on your network. Unfortunately when you ask it to run other add-ins such as CPU intensive audio and video streaming/compression it runs out of steam quickly resulting in dropouts, pauses and other issues. There is no total solution because of the limitation of the HP hardware and intent of design. Some of the limits are: a minimal power supply, Passive CPU cooling with low air circulation, limited case size and an unforgiving proprietary motherboard that is nearly impossible to buy on the open market with no recovery features. While we can’t solve all the problems we can improve performance to a more acceptable level and limit the risks of the modification. How much will this cost me and is it worth it? Obviously this is a major consideration unless you’re a hobbyist or just love hacking. It does not make much sense dumping a ton of money into a platform that in the end run won’t perform as you expect it to. Sometimes we just have to admit that no mater how hard we try we can’t make a pig fly. This is the conclusion that some have come to. If you are thinking this upgrade will make the 485 a barn blazing video eating audio blasting end all platform forget it. It will give you a 100% performance increase over the Celeron 440 and can be done for around $60.00. Granted you could spend a great deal more but how much you want to spend and how deep you go is up to you. This depends on the route you choose and the processor you select. For those who want a transparency and minimal work you have the following option: Buy an Intel Dual Core E5200 processor with sSpec of SLAY7 or QFHQ. This sSpec specific core will provide the all around best bang for the buck with the least amount of implementation work or operational issues. The E5200’s are readily available both new and used from many sources. E5200 processors are also used in the 3rd generation of the MSS. Let’s talk a little about what this sSpec code is all about. (I will cover E5200 sSpec SLB9T later in the article). The sSpec number is also known as the specification number and stepping code. It contains 5 characters (example: SLAY7 or QFHQ etc.) that are stamped on top of the processor and printed on the box to identify the processor. Do Intel processors of the same model have the same sSpec? Not necessarily, the same processor number can have many different sSpecs codes. This is because when a processor stepping change occurs, a new sSpec is generated for that stepping. It is also true that the same stepping level can also have more than one sSpec associated with it. What is a processor stepping? It is the revision level of the CPU silicon. The stepping version can be changed for a number of reasons, these can be to fix some errata, raise the performance/ clock speed modify die sizes or to reduce power consumption and can include micro code changes or update. Generally a higher stepping version is better, but not in the case of compatibility with the EX485. When stepping version change, what is the naming convention? Each stepping gets a different name. The usual naming convention is to change the letter of a stepping on each full-layer stepping and change the number of a stepping on the metal-layer stepping. As an example, the first full-layer stepping from A0 would typically be B0 and the first metal-layer stepping from A0 would be A1. In the case of our target processor, the E5200 there are three sSpec versions using 2 stepping models, M0 and R0. M0 is the most compatible for our MSS application and the desired choice. Where can the sSpec value be found? 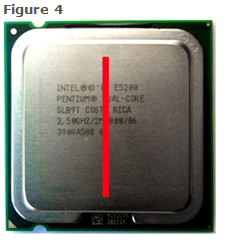 You can find this number by looking at the markings on the processor top-side (see Figure 1), or on the bar code label on the side of the processor box (Figure 2). Here’s an example of each location. Why is all this stuff important? This information is important because it is necessary to know how to identify and select sSpec for a given CPU and to select the one that will work best for our application. Before you agree to purchase any CPU be sure the seller can provide the sSpec code. Many have mentioned having some success with other dual core Celeron, Pentium and Xeon units. Some of CPU’s reported to work are the: E3300, E3400, E4400, E6300, E6420, E8200, L3110 Xeon’s and a few others. Some of these processors have higher clock rates, larger cache and advanced technologies some of which cannot be taken advantage of. For a CPU to be utilized for optimum performance the motherboard and chipset must contain the information to accommodate the processors abilities and operating parameters. This is partly done in the system BIOS. BIOS: (Basic Input/Output System) is a set of instructions and parameters that CPU uses to bootstrap or begin to startup. The BIOS also provides the necessary code to hand off the boot process to the boot loader on the hard drive and boot the operating system. The BIOS for the 485 is contained on a single flash chip on the motherboard. As you can see the BIOS is a key consideration. 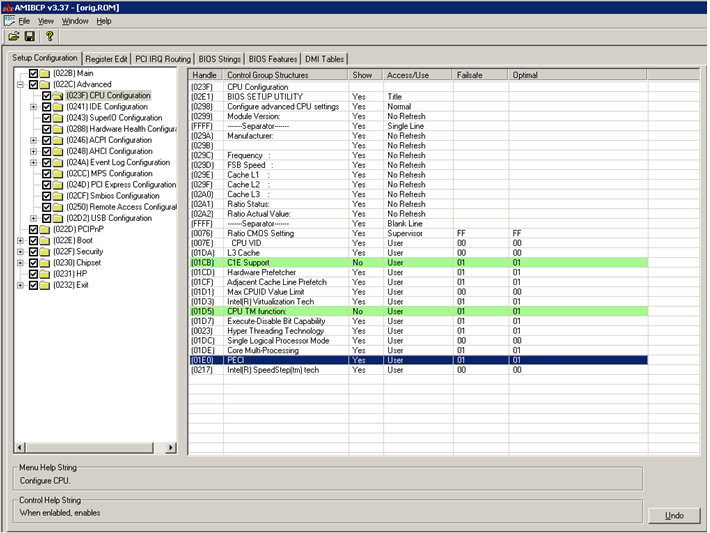 Values specified in the BIOS that do not fully match the CPU can easily cause operational inconsistencies within the MSS. The Intel E5200 appears to be the upgrade processor of choice. This article will focus on the use of this core. This is not to say that the E5200 is the best selection but it does have a number of features that puts it high on the list. First, it is the same processor that HP is using in the 3rd generation 490. Second, it is cheap (approx $60.00) and easy to find on the open market. Third it provides a noticeable improvement over the stock Celeron 440 core. Finally, it can be implemented with no adverse operational issues. 65w vs. 35w TDP (the Celeron draws less power but not appreciable in actual testing) This is one of the most important consideration when picking a dual core processors. You do not want to select a core with a power rating greater than 65w. Exceeding this value can create issues for the power supply and generate too much heat to be properly dissipated by the passive cooling used in the 485. Intel released 3 versions of the E5200 for general release. These can be identified by the SSpec code (see figure 1 and 2 above). Two of these are the SLAY7 and QFHQ versions are the easiest to implement in the 485 and are stepping model M0. No BIOS changes are required, this is simply and remove the old CPU and install the new one. All functions of your MSS will work properly. The only exception is the monitoring of the backplane temperature of -128c/262f in the BIOS display. Windows Home Server software will also identify this core as a Pentium 3 XEON processor. Neither issue is detrimental to the operation of the MSS and is totally transparent to the user. One note, to obtain the optimal performance of this and any dual core processor speed stepping can be disabled. This is a controversial point which will cover in the speed stepping discussion later on. The third version of the Intel E5200 was the SLB9T and is stepping model R0. The SLB9T is the current production E5200 release and by far the easiest to obtain. Because of the R0 stepping some items in the BIOS will need to be modified before the core switch. You cannot simply change the CPU without making necessary BIOS changes, if you try you will end up with a server that will not Boot. What must I do to uses the E5200 SLB9T? You have 2 ways to implement this CPU. The first is to “Flash” the BIOS with the required changes. It requires nothing but a BIOS file, no cables/adapters/keyboards and the most cost effective. This is also the most dangerous method and can result in a bricked server. Should this happen you need to send your motherboard back to HP for repair. This will cost you a minimum of $65.00. Generally, when properly done flashing the BIOS is an un-eventful thing and USUALLY completes without problems. Another complication for the MSS is that the user performing the update is totally blind to the process. There are no safeguards such as BIOS recovery jumpers used on most motherboards. Not so great if you have problems. The second and recommended method is to change the BIOS is the use of a KVM adapter. This adapter will allow the user to connect a PS2 compatible keyboard, mouse and VGA Video monitor to the MSS. It also makes tweaking and experimenting with the MSS easy and provides direct access the Microsoft Home Server’s console if needed. This adapter will set you back anywhere from $60 to $90 dollars depending on the version you get but well worth it. Consider it necessary tool and the pathway to the inner working of your MediaSmart Server. This adapter also opens the door to things like booting and installing alternative operating system from a flash drive. BIOS settings/changes and tweaks are a snap to do. You can also correct WHS errors from the console possibly saving you and your data from a full system recovery. If you consider the time and expense of buying the hardware pieces and parts to build you own this purchase is a no-brainer. The KVM is available from Charles at VOV Technologies. You can find his contact info in the following link: http://www.mediasmartserver.net/forums/viewtopic.php?f=6&t=3980 for details on the adapter, the configurations available and how to use it. I think the Keyboard/Video/Mouse edition is the best choice for the average person even though I bought the one with the additional serial port just to play with. This unit is a well constructed professionally built adapter. It is easy to install and Plug n Play. Plug the included cable into the CN-9 connector on the MSS motherboard, connect a compatible PS2 keyboard mouse and monitor to the ports and your good to go. The adapter can be stored in the upper drive bay for easy access to the BIOS/Console at any time without disassembly of the MSS. If all your drive bays are full the cable can be placed behind the lower front plate so you can attach the adapter without case disassembly. Before you do anything make sure your MSS is fully functional and operating properly. Starting with a sick or malfunctioning server is a sure recipe for disaster. You should have a recent backup and your server should be up to date. Boot the server a number of times and make sure all is well. Look at the event logs to make sure nothing out of the ordinary is occurring. Download and install CPU-Z, OCCT software to your server. This will help you verify core information, power and temperature date and give you a base line. Perform detailed CPU benchmarks before and after the upgrade, you will be amazed at the results. Based on the process you are using select the correct step below. For those using the E5200 SLB9T or other CPU’s the process will be: BIOS update/CMOS clear, case disassembly, CPU removal and replacement, case re-assembly, and a couple of reboots to get everything recognized. What will be affected, the server sleep and power down functionality will no longer work correctly and temperature monitoring features will be incorrect depending on CPU, not a big deal if your server runs 24×7 like most. It should be noted that some of the users on various forum’s have modified the EX49X BIOS to work in the EX485 using the newer Dual core processors. These modified BIOS’s correct the Sleep/power down function and allow proper CPU identification clearing the way for other processor use. Unfortunately these modified BIOS created some fan issues that have not yet been resolved. Hopefully the developmental work will continue. Sadly 2 major players working on these changes and very familiar with flashing have bricked their 485’s during this endeavor. If you choose to use a BIOS load off the forums it is most important that you know the source of the BIOS that you are using for flashing, you must also know exactly what setting have been incorporated. This can be very dangerous. You must be familiar with the flash process and have a stable power source before flashing. Consider plugging your MSS in a UPS before starting this activity. Should your home power drop’s out during the flash process you might end up bricked. We all know about Murphy’s law. Again, BIOS upgrading must be done BEFORE the installation of the new CPU (other than those using QFHQ or SLAY7). How do I Flash the BIOS and which version should I use? There are a number modified BIOS’s available for the EX485 and can be obtained simply by reading the thread listed in the reference section titled “The original HP EX485 CPU Upgrade thread, on mediasmarthome.com You could download and apply one of them but that’s up to you. unrar to a folder you can get to later. Download to another computer then copy them into a shared folder on your MSS under WHS. Log into your MSS. Create a BIOS subdirectory under the C: drive, copy AFUWIN32.exe and AMIBCP.exe to this directory. Execute AFUWIN 32 and on the bottom click save (this will save a copy of your original bios, call it ORIGBIOS) You should always maintain a copy of this file. Execute AMIBCP, open the saved BIOS file: ORIGBIOS you saved using AFUWIN above. On the SETUP TAB click on LOAD CURRENT OPTIMAL under CMOS Options. Take a deep breath and Click Flash. DO NOT INTERRUPT THIS PROCESS. Let it complete. Now reboot your server with original Celeron still in place to see if everything went right. PECI was enabled and set to 1. PECI is Platform Environment Control or thermal control that was implemented into the Intel Dual Core and not used for the Celeron 440. The MSS will not boot if this setting is not changed and the dual core installed. The PECI setting and speed stepping setting is totally transparent 440 so you can change enable it at will. The Celeron will work just find with PECI set to either value. The optional change disabled speed stepping. (see this topic in this document for further info) Now that the correct BIOS setting are in place lets start the hardware upgrade process. One note: when attempting to remove the top plate it is necessary to depress the retainer clip before attempting to slide the top plate forward. Failure to do so will result in the clip being damaged. Look inside the top drive bay at the roof of the MSS. In the center just a few inches back from the front you will see a slot, just to the rear of the slot is a clip that when pushed up will allow for the easy removal of the top plate. This is the recommended location and amount per the Artic Silver web site. Adding more than this is a waste of paste and just makes a mess. Carefully line up the heat sync and place it on the new processor. Gently rock the heat sync to allow the paste to distribute over the top of the processor. Complete the re-assembly procedure. Also, a cable assembly runs across the fan in the front of the MSS, using the slack in the cable pull it down and out of the way of the fan. Then using a cable tie secure the cable out of the way of the fan. This will help provide a clear path for the air and aid in cooling. Re-install the hard drives, reconnect the network cable and power. Have your PC with Home server connector booted and online. Power up the MSS, and notice the health indicators. If all is well the system should be fully booted and accessible via the Home Server connectors. If all appears normal but you cannot access the system perform a MSS power down/reboot. If at this point you still do not have access you can connect your KVM switch and should be able to see the status of the system. On a normal boot the console will present a login screen. If you see this screen then more then likely you have a networking/connectivity issue and not a CPU related problem. Depending on the problem and health indicators trace back your installation procedures. If you don’t have a KVM adapter your worst case scenario would require you to re-install your original processor to do additional troubleshooting and possible BIOS verification. There is much controversy around speed stepping and if it should be enabled or disabled. This discussion should help your make your choice. First, what is speed stepping or dynamic frequency scaling as it is otherwise know? It is the ability of the processor to up shift or downshift the clock speed of the processor based upon the processor load. The advantages are less heat and power draw. The disadvantages are CPU overhead required for speed management and time lag and low optimization. Microsoft suggests speed stepping should be disabled if problems are occurring with video processing. When testing I found that disabling speed stepping provided a noticeable performance difference with negligible heat or power increases. I was never able to achieve maximum core clock rates with speed stepping enable no mater how much I loaded the CPU. Based on the Microsoft recommendation and tests it is disabled in my platform. If you would like to disable the setting access the BIOS using the KVM adapter and set speed stepping to disabled. This can also be accomplished used the same procedure used to change the PECI setting and flashing the BIOS with the change. Use the procedure listed above, substitute “Speed stepping disabled” for PECI 00 00. Complete the process and flash the change. These performance results speak for themselves and are very amazing. I ran a number of temperature tests and found the data to be inconclusive. When running CPU intensive testing I found that the Celeron had a slightly cooler temperature than the Dual Core but carried that temperature longer. The Dual Core would spike but recover to a lower temperature quicker because it is a more powerful processor and able to complete the task quicker. If both the 440 and 5200 was loaded to max capacity the Celeron would run slightly cooler. Again this is not a conclusive test because of the ability of the dual core to complete the task quicker than the Celeron not only because of the dual processors but the much larger cache. As a note the Dual Core was never more than a few degrees warmer then the original Celeron and always with normal temperature values. These finding may improve as the Artic Silver 5 paste cures with time and dissipates the dual core heat more efficiently. The power draw of the E6300 was surprising considering it provided slightly better results than the E5200. This may be in part because it is a slightly newer generation core and more than likely as incorporated improvement but it also raises the conversion costs an additional $30 bucks, not sure if its justified. A dual processor with a larger L2 cache (such as the E8200) may be of some benefit but I don’t expect a major increase in performance. When the prices come down some I plan to work with the E8200 with 6GB cache just to see exactly what the difference will be. After some careful review and many conversations with some of the support engineers at HP the common consensus is that the MSS would not greatly benefit from a memory upgrade though it can be easily upgraded to 4gb. This is mostly because of its role in life is a minimal server and really does not need more than the 2gb it already has. Unlike Windows XP WHS can address a full 4gb so the memory upgrade would be used by the OS. Another issue is when you increase the density of memory on a chip you increase the power draw and heat dissipation. The cost of the upgrade would be over $100 and might provide little return on your investment. Jury is out on this one until some detailed testing and analysis can be done. Should you wish to perform this memory upgrade the correct part is 240-pin DDR2 SDRAM PC2 6400 G.SKILL Model #:F2-6400CL5S-4GBPQ. It is a pin compatible replacement for the existing 2GB memory part and should be recognized automatically without other changes. Overall I am very pleased with the outcome of this project. It is a relatively easy task that just takes a little planning and time to complete. The results were well worth the time and money. It also extends the life cycle of the EX485. I am sure this will greatly help the upgrade demands that 3.0 will demand once it is available. I selected the E5200 M0 as the processor of choice primarily because I want my MSS to sleep at night when it’s not used and to prolong the life of the unit. It would be a great resource to all looking to complete this upgrade for those using other Dual Core processors to share their experiences. Please consider the following, Before staying “Everything Works Great” please do in depth and complete testing. List your exact configuration and what you modified or changed. It would also be useful to those tweaking BIOS setting would list them as well. My thanks to those who take the time to share their work making these upgrades possible for all. OCCT Power, Temperature Monitoring software, excellent for testing CPU stats. A great; detailed guide. Thanks Dan! Great article. Thanks for taking your time to document this for the community. Totally Awesome. This is actually the first write up I have seen for the EX48x regarding a processor upgrade. I think those with EX48x’s will find this write up to be very helpful. Now I am eagar to read posts from those who followed the instructions here and hear their success stories. I — like you, am a former HPer, having worked for HP for almost 10 years. I am pretty familiar with the amount of work and testing needed to bring a refresh to market. While every roll out is different and presents it’s own challenges, I believe we will see some major product changes in the near future. With the launch of Intel’s i5 and i7 processor series it is not a far stretch to think that HP would glean major performance benefits on their MSS products. You have to believe that HP would have access to the Intel roadmap and would be designing, building and testing solutions for launch within a reasonable timeframe of the Intel announcement. Waiting until the fall (and giving AMD a chance to catch up would mitigate the impact that these chipsets), and would be a poor move on HP’s part, missing a chance to further dominate in this space. Therefore I believe we could see a major product launch from HP in the late spring or early summer sporting these chips. If correct, we could see the EX5xx line (just a guess on the line’s name) within a few months. I believe the mid would carry a dual core i5 and the ultra-hefty quad core i7 being used on the high end box. This would further differentiate the LX (low end, energy conscious, entry level server), while providing a noticeable difference between the mid and the high-end products. From a sales standpoint the majority of the market would still focus on the mid-range box (which is exactly what you want) while providing options for those on either side of the curve. Additionally, if I were the product manager for this line, on the high end boxes I would push for additional storage, more memory (say 4GB standard), and a blue ray drive built into the chassis, following the lead of the LG Super Multi NAS (model number N2B1DD1). For the LX I would do a basic refresh. For the mid box, the aforementioned processor change with no change to the memory or the storage at all. Finally price. It also seems to make sense to have $200 steps in pricing from low to high placing the LX in the $250 range (realistic), the mid at $450 (tougher, but possible), and the high-end at $650 (probably unrealistic with all my bells and whistles, but possible without the blue ray drive) in the near term. Of course I could be completely wrong about this. From a hardware perspective, given all the data that is out there, this does makes sense to me though. The only caveat would be the MSS software roadmap — it may actually make more sense to synchronize the hardware and software launches and get the most bang-for-the-buck. Great article on how to do this job, I just got a HP MediaSmart EX485, and since it is pretty new I’m planning on waiting the whole year for the warranty to expired, but then I will definitely upgrade the processor and hopefully more testing have been done on other high-end processors so I can go higher. This is because besides doing regular backups and have the server to store all my media, I also want to use it to stream movies to the PS3 and see it on my big screen. That some people have upgrade their server to a quad core processor Q8200S, which will be a good option for streaming and trans-coding purposes, but no sure how the MSS will behave since no results have been posted on this and other CPUs. Anyways really good guide and hopefully we can see more details on other CPUs as you said when the prices comes down. Thank you Alex and keep up the good work. Wow! Great article. This fully explains why my CPU upgrade went so smooth (just dropped new E5200 and everything worked) and others using the same CPU could not get it to work. Thank you Alex and Dan. This is a great article. Thanks for all of your work. I read it in detail even though I own an EX470 and an EX490. I recently modified the EX470 to an LE1640 chip and noticed the performance speed increases. I have an E7500 chip to install in the EX490 but have not done it yet as I am getting the server to back up all of my computers and getting the Media Collector to work. I was shocked to see how much the CPU was hammered in this process and it has run for 4 days at 100% CPU capacity to get this far. It is still not done. When I upgrade the EX490 to the E7500 CPU do I have to adjust the BIOS to reset the speed stepping settings? I have seen a lot of comments on this in the forums regarding the EX 485/487 but nothing on the EX490? In addition is there an sSpec on the E7500 that people have been successfully using in their EX490’s that I should be aware of? Thanks for the input and thanks for the great article. eidos, Since I do not have a EX490 to look at I could not give you a definitive answer, my guess is that you would have to enable PECI in the BIOS. I believe the Celeron in the EX490 does not support PECI, if this is the case the system will no longer boot if you swap to the E7500 without the change. You can easily verify this by using the BIOS tools specified in the article and looking at the existing setting. If you see PECI set to 0 and 0 you can be safe in assuming you will need to change it. I installed the E7500 and it worked OK. I had to boot twice to get both cores to show up. I was running Media Collector and the CPU was running very hot. I turned off Media COllector and it still runs warm but doesn’t glow in the dark anymore. I wish it was cooler but with Media Collector off it makes an amazing difference. The screens just snap into place and it is now very responsive. Glad it went well. The E7500 has the same thermal specs and is a 45nm core just like the E5200. Temperature wise they should be similar. Question, did you use Artic Silver 5 and just use a small bead down the center of the processor? If so you will find that the paste actually has a break in period where it levels out, fills the gaps and will actually become more efficient. Check the temps again in about a week. Also, make sure the large group of wires in front of the power supply are moved out of the way of the fan, this will help increase the air flow and drop the temp a degree or so. Enjoy your new high performance 490! I followed your instructions. I had used a size of a rice grain on a previous upgrade and felt your instructions to make more sense. It got very hot when the media collector was driving the CPU to 100% on both cores and actually went to 82 degrees C when it was freshly installed. I shut off media collector and let it cool down and it dropped 20 degrees C. I then let it sit over night off. It was cooler today runing between 48 and 62 Degrees C in a room that was 78 degrees F. It hit 62 while transfering 12 videos and backing up a computer at the same time with only 25 to 40% of the CPU being used. No other server could do that unless it had an upgrade. If I set a small 6 inch computer fan in front of the Server with the door open it runs at 43 degrees C. The server is simply designed with not enough fans. I think that after it heats and cools a couple of times it will get better as the paste sets in and the level smooths out. Hi! I followed the instruction above and successfully upgraded to an E5200 M0. However, I observed something unusual — the E5200 SLAY7 M0 is locked at 6X multiplier (1.2Ghz — using CPU-Z) if PECI is enabled (disabling Speed Step has no effect). I disabled PECI and it now functions normally at a full 2.5Ghz. I know from the instruction that the M0 stepping does not need PECI to be enabled but I thought I’d do it anyway. I hope this info is useful for those who are not seeing performance gains after a SLAY7 upgrade. Just like the user said, it runs at 6.0 x 199.5 MHz= 1200 MHz since I did not do a BIOS modification. I am confused about what to do to increase the core speed to 2500MHz. PECI or speedstep needs to be modified? Also, download link to the AMIBCP 3.37 has been broken. So, Dan or Alex, how much are you going to charge me to upgrade my 487? I’ll leave that to Dan, don’t think I want to get into the business of upgrading servers. I’ve not even upgraded any of mine! Your not gonna let that little black box scare you?? This is really an easy mod to do if you just take your time. The hardest part will be picking up the CPU you want to use! Right now I am in the middle of working on another project with the new Intel 980x 6 core processor but when I have that wrapped up I might offer some type of service to those who really want the upgrade but don’t want to dive in. I do check the thread from time to time so if you do decide to do the upgrade we will be here to help. Darned right. I am not going to open up that box. It’s enough that I can put an additional hard drive in without having to change my underwear. I know my strengths and weaknesses! Put me on your list of those who would like you to upgrade my 487. Great information!! Only problem is trying to find a E5200 with the right sSpec is not that easy. I have looked for several days locally and I’m not confident I will get the right processor when ordering over the Internet. If anyone finds another processor that is comparable to the E5200 and retains the sleep function, I would like to know! After upgrading the memory on my EX480 series to 4gb, I have noticed that backups times to an external USB drive are about 30% faster. During the backup I have monitored memory usage and it runs between 2.2gb and 2.8gb. During normal operations usage is at .9gb and 1.6gb. It does not seem to be worth the $120 investment. I just finished upgrading my ex485. Thanks for the guide it made the upgrade process a snap. I used an E5200 Slb9T I was unable to find the other ones. I only have one question Is there away to fix the sleep function. That is the one thing I would like back but the performance increase is great!! I have upgraded HP EX485 using E5200 CPU and 4GB RAM. I could not get SLAY7 therefore I ended up using SLB9T. Before changing the CPU I flashed the bios with SpeedStep disabled (00 00) and PECI enabled (01 01). After new CPU EX485 did not reboot, stopped health indicator flashing blue white. I swapped to old CPU and flash bios disabling PECI (00 00). System now working and stable. However when I runt the test it shows single core not dual. Is there a easy fix to make it duo core? When I check system properties CPU is identified as E5200 @ 2.5Ghz. I ran into the exact same problem as Rifat. I upgraded my machine to 4GB ram and the SLB9T E5200. I flashed the bios before the upgrade and verified that it took (PECI 01 01 and SpeedStep 00 00). I swapped out the CPU and the ram and the machine wouldn’t boot, just the flashing blue health indicator (I couldn’t see any white, but I have poor color vision). I swapped the old CPU back in and the machine booted up. I redumped the BIOS to make sure the PECI had been changed to 01 and it was. It was getting late so I had to sleep. I will reflash the bios to disable PECI and see if it will boot up with the new CPU tonight, but even if it does I imagine I’d have the same problem with it only seeing 1 core. I’ll post results when I can try it tonight from home. @SAM, @rifat…. I had the same exact issue when doing mine. I made the change to 00 00 for the Intel Speed step and i was getting blue health indicator as well when i first swapped out the cpu. After putting the old one back in I made the change for Intel Speed step back to the original 00 01.. It was able to boot as well. @RiFat… reboot your server once or twice and the system will show both cores. I think I had to boot mine twice before it showed both cores in taks manager. 3. Twonky has high CPU around 50%. To fix I turned it off by removing folders from it’s setting. Mines working fine now too. I had a scary moment because I bent a pin on the motherboard but it’s apparently making the right contact on the cpu because it’s working. I don’t think I’m ever going to risk taking it off though! It’s showing both cores after a reboot. The temperature fluctuates a lot between 53c and 68c, but I don’t trust the reading. It will show 67 one moment and then 62 the next, and I know it didn’t drop 5c that quickly. I don’t do a lot of media streaming on mine but I do have VMWare server running with 1 VM that’s nice and responsive (that’s why I did the memory upgrade as well as the cpu). I upgraded my EX485 to an E5200 (SLB9T). Had to disable the PECI to get my system to boot, otherwise the health status light just flashed blue always…. Runs system 3.0..
How can I fix this blue flash? I upgraded ex485 today with 4 gb ram and the e5200 slay7. I couldn’t get the server to boot up with the new CPU. The server would get to loading windows home server and then keep rebooting. I couldn’t get the server to startup again. So, I tried it without the heatsink (not sure why I tried it)–The e5200 did work without the heatsink, and it loaded fine. I wasn’t comfortable running without the heatsink so I reinstalled the heatsink and it wouldn’t startup again. Finally I gave up and went back to the original cpu with heatsink and it worked fine. I have no idea what is going on. I can’t see a height difference between the cpu’s and can’t figure out why the heatsink could be messing things up. I am lost. Any ideas? I was unable to find a E5200 locally, however, there are E5300 available. Please let me know if E5300 will do in upgrading for existing EX487? Couple of things I would like to mention that might help, this cpu upgrade procedure takes a couple of things for granted, they are: EX485/7 with BIOS Date: 09/23/08 13:45:28 Ver: HPMSS017 running Ver 2.5 software and 2GB of ram. If your configuration is different your results may change as well. Two full reboots are required for the CMOS to be updated and for the software to recognize the 2nd core. The QFQH sSpec will also work for those having problems finding the SLAY7 E5200′s. The E5300 processor will also work but you will have the same operational issues the SLB9T. Finally, for those having problems if I might suggest, keep the original upgrade process as simple as possible. If you have a system that is in trouble put back everything as it was originally. Perform the CPU upgrade, then once your satisified with the results perform the RAM upgrade. Again verify your results before moving to the 3.0 upgrade. I am finishing up my I7 865x project. Once that has been completed I think I need to revisit and check out what effect 3.0 as well as the memory upgrade might be doing to complicate the process. Finally, for those who are experimenting with other processors other than the E5200 if you could share your results it whould be of great service for those looking for alternatives to the E5200. any body been able to figure out how to fix sleep cycle for SLB9T yet? After looking around at various options, I decided on a Celeron E3300 for $50 from Newegg for my EX485. I did some research and it compares favorably to the E5200. Compared to the E5300 and E5400, your are paying $15-$20 more and not getting much more performance. All in all a great deal for a minimal amount of money. The guide was very useful, just a PECI update and I was good to go. All instructions were clear and concise. While I did the update, I replaced the PSU fan as well. Not I am done with my upgrades. Great article. Follow up to my previous post, if you are looking at performance results for your “future” CPU upgrade, this is what I used to compare the CPU’s: http://www.cpubenchmark.net/high_end_cpus.html (E5300, E5400), http://www.cpubenchmark.net/mid_range_cpus.html (E5200, E3300). Excellent choice and possibly the solution for those having difficulty locating the E5200 QFQH/SLAY7. I have compared the specs between the E5200 and the E3300 processors and they are almost identical with some very minor differences. Have you tested the sleep/shutdown feature with the Celeron E3300 SLGU4 processor? The sleep issue associated with the SLB9T is an issue of an incompatility between the CPU microcode and the BIOS. BIOS modification in the HP MSS can be very dangerous because of the lack of a recovery feature . As a result experimentation to correct these BIOS issues can result in a bricked server with no chance of recovery short of sending it back to HP. how many of us are anxiously waiting for martmeister’s reply? Though I hope I am wrong on this I am afraid the SLGU4 version of the E3300 is going to have the shutdown issue the SLB9T. I have been looking at the microcode used in the SLGU4 and it is closer to the SLB9T than the SLAY7. The only way to know for sure is to test it. Let’s keep our fingers crossed! I just upgraded to the E5200 SLAY7. Running the Vail beta and I can’t seem to get cpuz to show anything higher than a 6.0X multiplier. Do I need to disable SpeedStep? I know that the Vail beta is a new 64bit WHS system. I do not know what dependencies it has on the BIOS but I would believe that if you disable speed stepping you will see a difference. The multiplier is indirectly tied to speed stepping. Check it out and let us know the results! So I just tested out the sleep function and it goes to sleep BUT doesn’t awaken from it’s slumber. I set it up to sleep between 7:05PM and 7:10PM. It shutdown the HDD drives fine but it seems the full functionality is not working. Network light is off. I must be honest I think I tried this with the old CPU and I don’t remember it working then either. I might be wrong. I just remember it being annoying that you couldn’t access your server at certain times. It became like a shop with business hours. Same deal with the shutdown, HDD were shutdown but the PSU is still running. The health indicator is flashing (blue), network light is off. Sorry people! Sounds like this a deal breaker for several people. I guess the quest continues. Let me know if there are any other questions about the E3300. Thanks for the update, at least you can get it to partially sleep. Does it awake properly when a server awake signal is sent to it via the Mediasmart console? Also consider a test with a sleep time greater than 1 hour. The MSS is a littly flaky about sleeping when HDD distribution and updates are pending. Looks like I had to enable PECI to 1 and Speedstep to 0 for the SLAY7 to operate at 2.5Ghz. I upgraded my EX485 successfully with a 5200 SLAY7 (M0 stepping 6) with HMPSS-1 09/23/2008 BIOS. To get 2.5GHz you must have PECI = 0. Speedstep seems to be enabled regardless of speedstep BIOS setting (0/1) as processor runs at 1197.2GHz and then ramps up to 2.5GHz under load. Temperatures okay (42C junc / 50C case according to SpeedFan) at idle, peaking at 58C (junc) when I ran OCCT LinPack for an hour at 100% CPU. I’m not sure why the case temperature is higher the core temperature. Temperatures are well within spec (74.1C max). I used OCZ Freez for the thermal compound and it seems to work well so far. The WHS console still takes awhile to load, I expected it to be faster but the raw performance is much better. The only problem with the upgrade was actually getting a SLAY7 processor. I got mine from a small computer shop. They are discontinued from Intel. I tried a longer sleep time to no avail. The Wake on LAN didn’t work at all so little success with the shutdown/sleep. And just to confirm, I did try the sleep functionality with my old Celeron 440 and the WOL didn’t work. So whether its the software or hardware not sure but it doesn’t seem to be the CPU. I can safely say I can build my EX485 with my eyes closed now. Not a bad thing as I am sure something will need to be replaced in the coming years. I have a SLAY7 processor but my BIOs (from the support tab in the Home Server Console) says BIOS version HPMSS-01 9/23/2008. Will have trouble since my Bios is not a match to yours? ws2000 – It was a typo in my post regarding the BIOS, it should be HPMSS-01 23/09/2008, the same as you. If you follow the steps in the guide you should have no trouble upgrading your server. Just ensure PECI = 0 (which it will be by default). Interesting results, after reading your post I thought HP might be using TPI (transport layer security) which would limit the wake up feature strictly to the Windows Home Server Connector program (which has embeded security). This though is not the case, the 485 should respond to a simple WOL in its stock form. Here’s a handy program, Try the following from another PC on your LAN. Looks like your question has been answered, the BIOS dated 9/23/2008 is the latest production version, your good to go! Now click on Wake Me Up, your 485 should wake up (Celeron or Slay7). If it doesn’t log directly into the 485 console, open my computer, device manager, open network adapters and select the Realtek adapter, open the advanced tab and under properties set the wake-on-lan capabilities to: Pattern Match & Magic Packet, also make sure the WOL & Shutdown Link speed is set to 100M (assuming you have a 100M or greater speed lan). Most gigabit networks will negotiate at a lower speed and upshift. If this is incorrectly set the WOL can be lost on initial link negotiation. I’m able to WOL my EX487 via the WOL feature in my Tomato-firmware router, so it seems unlikely HP would be doing anything to secure the WOL feature. about this chip is that it shares the CPUID as the SLAY7 as well as the same stepping revision so it might not have the sleep/shutdown and wakeup issues. I was given this head’s up from a friend at Intel. I had mentioned the limited supply issues of the SLAY7 and QFHQ. He did some digging and advised we should try the E2210 SLB7N as well. After reviewing the engineering specs I think he might be right. This chip is almost a perfect match. The E2210 should provide similar performance increases over the stock Celeron, it does have a smaller cache than the E5200 but still doubles the size of the Celeron 512kb cache. All other specs are identical to the E5200. Like the E5200 processor the E2201 has 2 versions, you want the SLB7N AND NOT THE SLB9R Make sure you verify this before buying!!! Though I have reviewed the data I personally have not tested this processor. It looks very good but the jury is still out until full testing can be completed. Will this work on the older 470 series? Sorry, these processors upgrades will only work with the EX485 and EX487. Hey Dan, I checked out the WOL tool but it didn’t work with the E3300. So that’s checked off the list. Thanks for the all feedback/ideas! Some additional info before I…Upgrade to the SLB9T. I have read all the comments and not sure about the bios flash required. I have ex485 bios HPMSS-01 23/09/2008 updated SW to system 3. Can someone with this configuration please verify???? Those settings enable PECI (to get the MediaSmart Server started) and disable Speed Stepping (to allow the MediaSmart Server to always run at the maximum CPU speed), which is his goal. I went ahead with the update last week and have been running great so far. I initially tried with PECI on but it wouldnt boot up like the others have mentioned. It took me 4 hours total – could have been done in 2 if i hadnt had to reflash to turn off PECI. I rebooted a couple of times and both cores are now showing up. Overall I am quite happy with the outcome. Thanks everyone for your efforts. Your contrary PECI results don’t surprise me. In theory, there are reasons that those results may be predictable. It is my understanding that the original Celeron 440 CPU in the EX485 supports PECI. Yet HP decided to leave PECI disabled in the bios. Now people are trying to install other Intel CPU’s that also support PECI and for some unexplained reason believe that they have to go through all this bios flashing to enable PECI when it was unnecessary, or undesirable, for the original CPU. If you have a desktop with a PECI enabled Intel CPU and a motherboard that actually supports PECI, and you choose to go into the bios and enable or disable the PECI setting, the machine starts either way. Enabling or disabling PECI might generate a variance in how temperature readings are reported, but that is a different subject. So I really don’t understand the presumed correlation between fiddling with PECI in the bios to a setting not used by HP for its original PECI enabled CPU and whether or not a machine starts with a different PECI enabled CPU. Disabling Speed Stepping in a machine like an EX485 that may sit idle for long periods and suffers from marginal cooling in the first place also seems like a dubious proposition; the CPU seems to return to full speed when under sustained load anyway. About all that disabling Speed Stepping as an Optimal Value seems to accomplish is to make it easier to get snapshots of CPU-Z at the ramped up values, albeit at the expense of generating more heat full time. Interesting subject, but I must be missing something. Sorry to take so long to answer your questions, I have been out of town, As far as the values in the article are defined they are correct. Probably the confusion is the speed stepping and sStep version used. First let me say changing the speed stepping is not required for ANY processor you choose to implement and is up to the user and results they want to achieve. As I mention in the article speed stepping is enabled by default, in order to remove the overhead and have the processor running at full speed at all times it is suggested to disable this feature. Most folks on the forum seem to want full cpu speed all the time. Performing benchmark testing with and without speedstepping provided interesting results. These were without speed stepping actual cpu performance increased approx. 10%. The only thing I can speculate about this difference is the overhead required for the upshift and downshift of processor speed. It is also true that disabling speed stepping does increase the overall system temperature at idle (minimal, approx 2c) but this is not the case under full load. Under full load speed stepping setting makes no difference in core temperature. If the user doing the modification moves the cable that partially blocks the front fan its a wash at idle and runs slightly cooler at full tilt. PECI, it is true that the Celeron 440 is capable of PECI and that is why changing this value in the BIOS will be ok with it. The E5200 uses a slightly different temperature monitoring circuit and the slb9t made additional changes to the microcode that enforces its use and prevents the boot of the later cores. This is why the later processors require the PECI change and the SLAY7 does not. PECI as I understand it has been full implemented in the 495. With a little luck I hope to be getting a motherboard that I can experiment with and an E8300 cpu. I am going to socket the flash chip so I can try fiddling with the BIOS and be able to recover it and be able to write it at will. I think a updated BIOS can be written using the 495 as a template. The PECI implementation is the major problem that creates all the problems using the later chips. Hopefully we can resolve this. To be continued…. FYI The reason I am upgrading to 4GB is to run VMWare Server for a Linux environment on my EX485. perfect if you are using the stock processor G.Skill PN F2-6400CL6S-4GBMQ, if your using an upgraded processor and running it with speed stepping turned off use: F2-6400CL5S-4GBPQ. This second SDRAM is rated a little faster and will eliminate possible memory timing issues. An added plus is they dissipate heat very well because of the built in heat sink. You might have to look around a little for these but G.Skill makes a great product they are worth the extra work to find them. As far as the Mushkin’s, I have used their products in the past and find them to be very dependable as well. I think it would be fairly safe to say you would be good with a CAS 5 or better SDRAM and I believe the product number you provided meets that spec. As I mentioned in the article 4Megs of ram in the Windows Home Server application for the most part is not worth the bang for the buck. Perhaps that is not the case with Linux. Your finding will be most interesting, keep us posted! Thank you for the response! I will look around for F2-6400CL5S-4GBPQ. Newegg currently does not have it in stock . I hope to get this Googlevoice + Asterisk pbx (PiAF) + Free DID from SipGate project running on my EX485. I would like to avoid setting up another box to act as a server when I have the EX485 running all the time. There is an option to run this project off a router but I would love to use the EX485. I am trying to upgrade my EX485 to an E6500 processor (Fry’s had them on sale). When I try to run the AFUWin.exe file to save my Bios I get a permission error (Windows cannot access the specified device, path or file. You may not have the appropriate permissions to access the item). I am running version 3.3.1.35433 of the media smart software. Also try running the file from the desktop instead of the shared folder. Thanks. Finally got the processor to work. After I updated the Bios I had to remove the jumper I added for the keyboard in order to get it to boot up. So far everything appears to work. The temps are running between 49 and 59 C. Not much different then the stock processor as far as heat. Will continue to test. I knew that the sleep function wouldn’t work anymore but it is also not shutting down. Anybody know of a fix for that? Re: the E6500 – what were your PECI and speed stepping numbers? When I try the boot with the jumper in, I cant enter Setup and have continual blue flashing led. Did you have the same issue and removing the jumper allowed it to boot? I had the same issue and removing the jumper allowed it to boot. It would not boot with the jumper in place. I never did get it to shutdown right. If I go to the control panel and hit shutdown it sounds like the unit shuts down (the Lan port stops flashing and the hard drives sound like they have been shutdown and the fans stop I think) but the front lights remain on. So I wait until I hear the shut down relay click then manually power off the unit by holding in the sleep button. On the plus side the server is very responsive and my temperatures have been very similar to what they were before the upgrade. Turning the speed stepping on seems to help with the temperature of the unit. Ok, thanks. I modified PECI in the bios, left speed stepping along and flashed. When I went to the Setup via the KVM debug, PECI was disabled. So, I’ll have to recheck the flash file. But, I enabled PECI in Setup and still no boot, with/without jumper. It gets to the end of memory test and flashes blue led constantly. Mine is an EX 485 machine is yours? The only other difference that I can see in the setup you are describing from mine is that I do not have the KVM switch installed on my machine. How are you getting the KVM switch to work without the JP2 jumper in place? Did you add it back to check the Bios, if so make sure you removed it again before trying the reboot. I thought that the JP2 jumper had to be added in order to get the KVM switch to work? For my machine I believe I gave up on the hope of being able to use the KVM switch once I upgraded the processor. I do not know for sure because I do not own one of the WHS KVM switches, I had only installed the jumper in the hopes of adding one later if I needed it. Mine is EX487 (485 with disks), so same machine. Got KVM switch from vov technologies. Without jumper it does not wait for kbd input (it seems). With jumper, it allows DEL for entry to Setup. This only works for the Celeron. With the E6500, jumper or no jumper, it halts after memory test and doesnt enter BIOS. I’ll take the KVM off and see if it boots. Just a couple of comments that might help, first the EX485, EX487 are identical with the exception of the amount of storage space available. Second, PECI must be enabled for ALL Dual core processors (exception of the SLAY7). You should make ALL bios changes before upgrading from the Celeron as you should be able to boot normally after the flash. Third, you do not need to move the keyboard jumper, leave it as it was from the factory, all you need to do is hit the DEL key while the POST is running to enter the BIOS. Remember, 2 boots are required to update the CMOS to reflect the new dual core processor. Finally, Sleep/Shutdown will not work properly and is the only downside to using processors (other than the SLAY7). This probably will not be resolved because of the dangers of expermenting with making major changes to the BIOS and having no way to recover other than a flash chip replacement. I also don’t expect HP to release any new revisions to the 485 as it has been discontinued. Thanks Dan. I’ve verified PECI set to 1/1, SpeedStep 0/1. I’ve got the KVM setup and changed PECI in the BIOS with the celeron in place. Rebooted, functional. swapped the E6500 and celeron. Powered up. Hit DEL to enter BIOS, which was recognized, but it halted just after memory test. Swapping the celeron back in, it does a normal boot. It might be a driver problem compatibility (USB) or disk as the next step was normally disk verification/load. Removing the disks (2) with the celeron causes the internal recovery to occur. Removing the disks with the E6500, it never gets to the internal recovery. Since I cant get into BIOS with the E6500, I’m lost. I cant get an E5200 SLAY7 anywhere. Any thoughts? Couple of question, Did you change anything else in the BIOS, even possibly by accident? Also do you have a spare SATA drive? A couple of differences that may be an issues is that the E6500 has a FSB speed of 1066 where the E5200 has a FSB of 800 and a feature called Intel® Smart Memory Access which Optimizes the use of data bandwidth from the memory subsystem to accelerate out-of-order execution, keeping the pipeline full while improving instruction throughput and performance. This feature is not built into the E5200 and the 485′s BIOS whould not have a clue of how to deal with it. I don’t know how much you like to experiment but here are a couple of suggestions with the easy ones first. While the E5200 SLAY7 are getting difficult to find you can get the E5200 SLB9T all day long. These work well and for the most part are plug and play. Once you determine all is well and working correctly (dont forget to check the event logs in the server) you can move onto shutting down and re-installing your original drives and you should be in good shape. My EX485 is running and displaying temps that appear reasonable in the control panel, I have no way of knowing if they are correct or not. Maybe the spec numbers are different. I won’t be able to check mine for a couple of days. This will give you a more accurate core temperatures than the one displayed in the Windows Home Server Settings screen. I have been told as much as 10 degrees C difference from the WHS status console. Thanks Dan. I’ll try the BIOS default reset with the Celeron. James, I don’t know which country you live in, but if you’re in the UK a source of a E5200 SLAY7 CPU is here: http://www.lanterncomputers.com/index.php?main_page=product_info&cPath=16_31&products_id=353. Looks like they have one in stock – get it while you can! I used them some time ago and the upgrade to my EX485 went well. I also lapped the CPU heatsink to keep temp low and changed the power supply fan to a Papst one as the stock one was making far too much noise. Ongoing saga. Found an E5200 SLAY7 (used) on kijiji. Got it this morning. Will change bios back to PECI 0 0 (once current backup is finished) and install the E5200. If that all works (should, I hope), then will likely abandon the E6500 until I find a blank spare drive in my travels as I need to get the WHS back up to snuff asap. Did you get around to that heatsink + fan upgrade. I live in Australia and because the ambient temperature is generally in the 20′s and 30′s I am getting very high CPU temperatures under sustained periods of load on my upgraded CPU and the occasional heat related lock up. I think. Will need a more thermally efficient or active heatsink for this CPU. did you mention that you were working on a solution to this problem? I wondered if an active 1RU copper heatsink might fit in this chassis (and mounting holes). I tried a number of ideas including milled solid blocks of copper with a passive heat sync mount on top. The idea was to leach as much heat away from the processor. While this worked I was still unhappy with long term heat increase for extended periods of heavy cpu usage. The amount of air moving through the case by the tiny fans just won’t pick up the heat and remove it from the chassis. Passive solutions just don’t work well, they rely to much on whatever air flow there is in the case to remove the heat. I tried substituting different case fans as well, this too worked with limited success. Once I got the temp. to a satisfactory level those tiny fans made so much noise it was crazy. As far as an “Off the shelf” solution I was not able to find anything that would just bolt in thanks to the oddball pattern. It really is an effective approach that does drop the cpu temperature. Since the fan is buried deep inside the unit there is very little extra fand noise. It’s worth the time it takes to get the parts and make up the assembly and is much more effective than the passive approach I took. WHS 2011 installed on HP EX487, Under “Computers and Backup”, “Additional Client Computer Backup Tasks”, “Tools”, “Computer Recovery”, “Create Key”, has anyone got this to work? That is has anyone created a PC Restore USB Flash Drive Key for WHS2011? If so please advise as to how you did it! Actually the picture showing the application of artic silver is correct for the E5200. There was some confusion regarding verticle or horizontal application but after conferring with an Engineering at Artic Silver the specific E5200 SLAY7 should have the application as shown. According to the engineer Intel changed the orientation of the processor in the later dual and quad cores. I was told that it really is not that critical when a sufficient quantity is used. As the heat sync presses on the cpu the combination of the pressure and heat will cause the paste to migrate into the micro pore surface of the processor. This creates the path to dissipate the heat. If you take a look between the processor and heat sync after about 1 week of use you will see a small ribbon of paste around each side of the CPU. Just like user jnu said, it runs at 6.0 x 199.5 MHz= 1200 MHz since I did not do a BIOS modification yet. I am confused about how to increase the core speed to 2500MHz. PECI or speedstep needs to be modified? In order for the E5200 SLAY7 processor to run at full speed all the time you must change the speedstep setting as outlined in the article. As far as AMIBCP check http://www.ami.com/support/ to see if the download is available directly from AMI. Here is my success story. Flashed with Celeron first to be sure that it will boot up. Second boot and still at 1200Mhz. Interesting, even though Speedstep in disabled in bios, processor still throttles down. According to CPUz, it jumps from 1200Mhz to 2500Mz (multipliers 6x vs 12x). But Realtemp shows CPU speed between 2100Mhz to 2500 Mhz (multiplier 11x vs 12x). I don’t know which one is correct. The cooling fans at the back of the case speeds up on high CPU load. So I assume motherboard temp controls doing their job. 100% = max 52,58 C (Celeron 55C) Tested in a cool ambient temp of basement where the box lives. In a warm room, it maxed at 70C. I checked the power use simply by Cyberpower PowerPanel program. 100% = 63W (Celeron 50W) This is the only difference! Just wanted to share my experience. Thanks. I was happy with E5200 in EX487 running WHS2011. But I wanted to have Intel® Virtualization (VT) – reason is a long story. E5200 doesn’t support VT. So, I swapped the E5200 with a E6500 (Wolfdale 2.93 Ghz. 1066 FSB, 65W). Everything works fine except that I don’t see VT is not enabled. In the BIOS, Intel Virtualization is set to 01,01. Has anyone verified that VT works in these machines? I rebooted the machine several times. What am I missing here? Take a look at this link regarding hardware support of VT. There are a couple of downloadable tools to help determine support of the technology. Since I don’t have a 487 I can’t look into the BIOS to see exactly what the support is, perhaps these tools can provide more info. How do I tear down my EX474 Mediasmart server to install a new power supply?